Congrats to Ziortza Gandarias Beldarrain on Completing her PhD Defense! On August 30th, the committee of Dr. Xabier Irujo, Dr. Mari Jose Olazregi, Dr. Justin Glifford, Dr. Mario Santana, Dr. Joseba Zulaika, Dr. Meredith Oda and Dr. Sandra Ott all gathered to hear PhD student, Ziortza Gandarias Beldarrain’s PhD defense. When asked to explain her dissertation, Ziortza explained “The cultural magazine Euzko-Gogoa was undoubtedly an emblematic leader in the history of the Basque press and a symbol of the resurgence of the Basque language and nation during Franco’s dictatorship. However, there is very little academic research on the contribution that Basque literature in exile made to the secularization and modernization of Basque literature, and even less research about the magazine published in English. 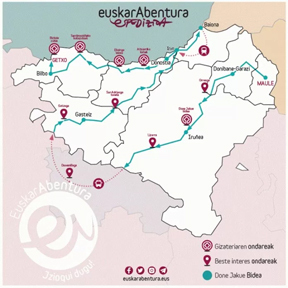 Euzko-Gogoa, since its beginnings, played an important role in the Basque culture. The symbolic, idealistic and vocational understanding of culture, which was characteristic of the 1950’s, created such a vital and dynamic movement that it is almost impossible to talk about the Basque cultural renaissance of the 1960’s without properly examining this magazine. The impact of exile was instrumental in the process of planting the seeds for future nation building. With a country defeated and its culture outlawed, it was in the diaspora where the Basque nation could be rebuilt and re-imagined. Euzko-Gogoa created a foundation of ideas that would serve to maintain the dialogue of a desired community while maintaining and developing the Basque language and culture. This dissertation acknowledges the exceptional nature of exile and its impact in the character/identity of the magazine.” The once grad student, passed with flying colors, and is now headed to Boise State University for a lectureship. Congratulations once again to Dr. Ziortza Gandarias Beldarrain on all her accomplishments and we look forward to all she will accomplish in the future! Welcome to our newest graduate student, Callie Greenhaw! Callie is a University of Nevada, Reno alumni, having earned her BA in Anthropology with a minor in Archaeology in 2016. When Callie was an undergrad at UNR, she took Dr. Ott’s Basque class to fill an academic requirement, and ended up really enjoying it. Growing up in Elko, Nevada, Callie was surrounded by Basque culture constantly, but did not realize its significance until this class. 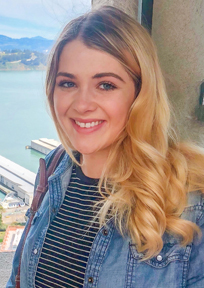 She enjoyed the class so much in fact, that she considered minoring in Basque Studies, but did not have time, and instead took as many Basque Studies classes as she could before graduating. Before returning to UNR to pursue her PhD in Basque Studies, Callie traveled to Greece and the UK to pursue her studies, and went on to earn her MS in Bioarchaeology and Forensic Anthropology from the University College London in 2017. Up until now, Callie’s field of study has been dental anthropology, her thesis at the UCL being the postmarital residence patterns of post-medieval Chichester in West Sussex by analyzing the sexual variation of dental nonmetric traits. During her time with us at The Center for Basque Studies, Callie will be studying the Basques of Elko. Her goals include providing an academic study to the Elko Basque community and add to the collection of research on the Basque Diaspora, learn Euskara, and gain teaching experience and publish some of her research. This semester Center for Basque Studies student, Kerri Lesh, was awarded a Bilinksi Fellowship for 2018-2019 by the College of Liberal Arts. She has been the first student from the Center for Basque Studies to be awarded a Bilinski Fellowship. A reception was held for the eight awardees who were announced May 3rd. Associate Dean Jane Detweiler presented the awards after a short welcome speech provided by Dean Debra Moddelmog. The previous year’s recipients were present to share their work with a poster presentation as they noshed on cookies and fruit. Kerri was awarded $30,000 to support her in writing her dissertation, which focuses on the use of Euskara alongside the marketing of local gastronomic products of the Basque Country. Russell J. and Dorothy S. Bilinski’s goal in life was to be independent and challenged intellectually. They strongly believed in people being self-sufficient, ambitious, and above all, responsible. Both Russell and Dorothy were true intellectuals, as well as being adventuresome, independent and driven. Russell was a researcher, academician, and an entrepreneur. Dorothy was an accomplished artist and patron of the arts. Russell and Dorothy believed that education was a means to obtain independence, and this is the legacy they wished to pass on to others. In furtherance of that goal, when Russell and Dorothy died, they left a significant gift for the formation of a nonprofit corporate foundation. The Bilinski Educational Foundation seeks to fulfill this legacy by providing fellowship funds for post-secondary education for students who have demonstrated, and are likely to maintain, both the highest academic achievement and good moral character, but who lack the financial resources to complete their post-secondary education.